Since last week we covered the FREE things for you do to, today’s post is about the things and places that are worth splurging and spending a few extra bucks in NYC. Keep in mind, my definition of “splurge” might not be the astronomical prices you are expecting, BUT this series is about traveling to NYC on a budget so for those looking to keep their spending to a minimum, or those with a large family, these prices can add up. So if these prices are cheap to you, even better! Observatories: going to the top of one of NYC’s most iconic buildings and getting to view the entire city in all it’s beauty is a must (if you can)! I would suggest going up at dusk so you could see the City just as it starts getting dark. It’s breathtaking! 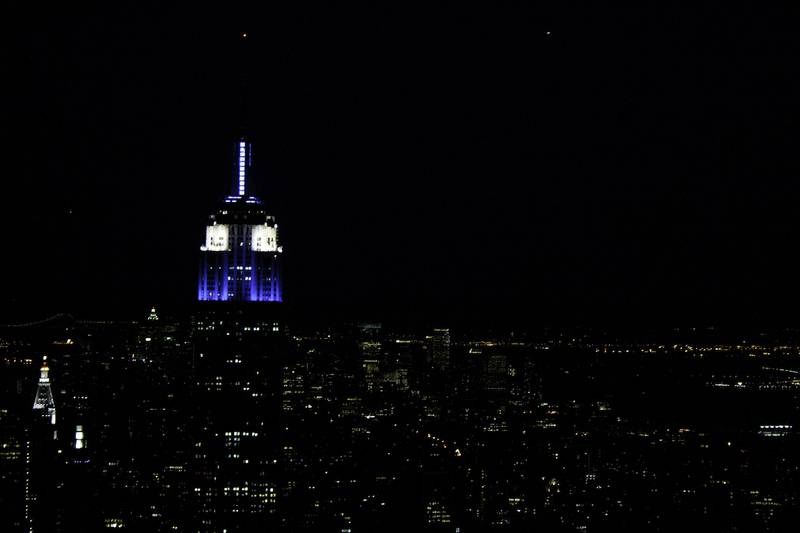 Empire State Building – This iconic NYC building is stunning! Tickets to to main observation deck are $32 (higher options are available for additional prices). One World Observatory – opening May 29, 2015! You can view videos and photos on the website currently and it looks amazing! Tickets are $32 per adult. Top of the Rock, Rockefeller Center (my recommendation) – It’s been a few years, but I have been to the Top of the Rock and it was spectacular! When I went it was at night so it was dark. The city was all lit up and spectacular. The reason I prefer Rockefeller Center, is you get the beautiful view of the Empire State building in your pictures! 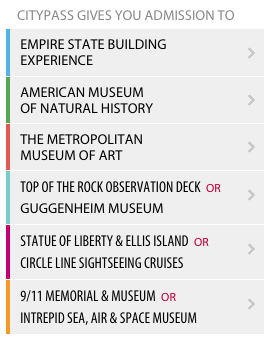 Tickets to the Top of the Rock are $30 per adult. MoMA – The Museum of Modern Art, admission is $25 per adult. The Whitney Museum of American Art aka Whitney – recently moved to a new building and just opened on May 1st! Admission is $22 per adult. The Guggenheim – Admission is $25 per adult. American Museum of Natural History – Suggested admission is $22 per adult. 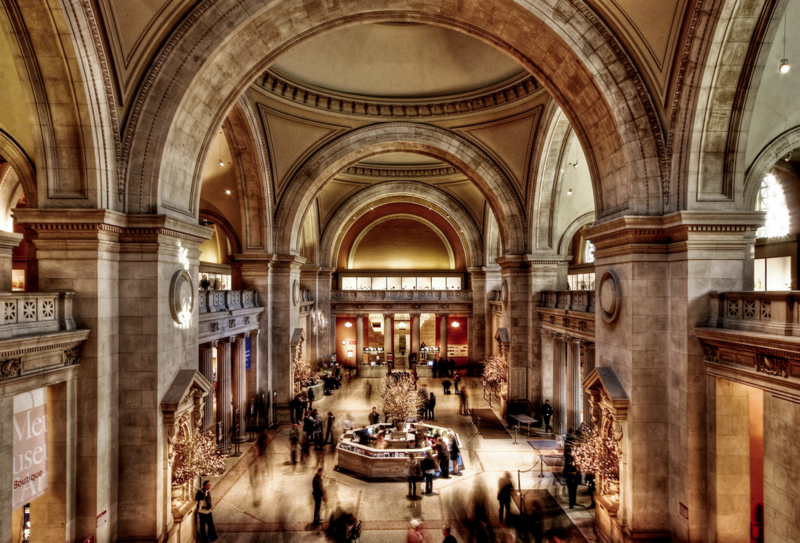 The Metropolitan Museum of Art aka the Met – suggested recommended is $25 per adult. TKTS Ticket Booth – locations in Times Square, South Street Seaport and Downtown Brooklyn, you can buy tickets for same day shows up to half off! Check the website for current listings and prices. TravelZoo -Under the Entertainment/New York City tab you can always find great deals on shows. Circle Line Sightseeing Cruises – all types of tours, including Best of NYC Cruise and a landmark cruise. Classic Harbor Line – everything from yachts to huge sailboats, dozens of different options to choose from. *I found a current deal for a Manhattan skyline cruise for $32 per person (regular $42). Hornblower Cruises – dinner and brunch cruises. 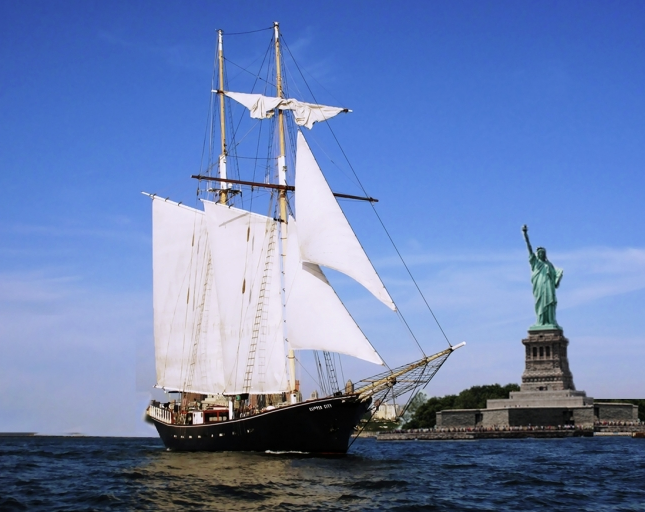 Manhattan by Sail – huge sailboats, offering different tours around NYC. *current deal, Statue of Liberty Cruise $29 per person (regular $44). 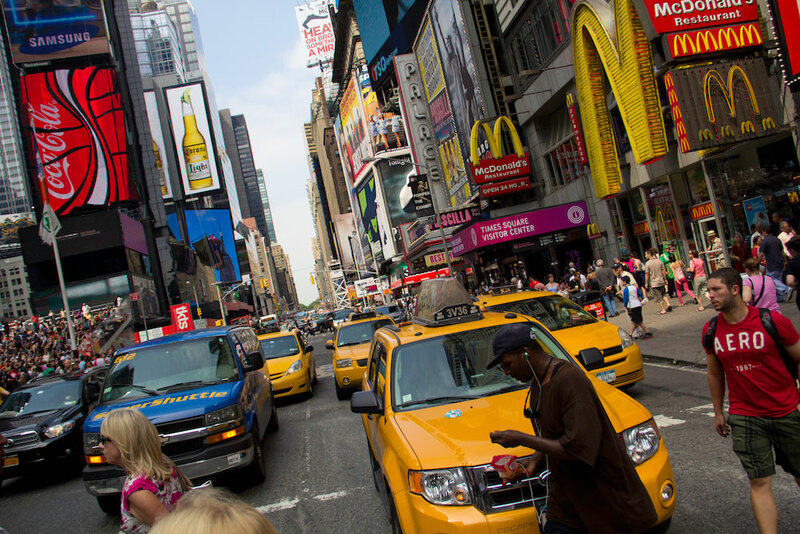 Big Bus Tours – double decker buses, open on the top, taking you by all the major NYC landmarks. Prices from $54 per adult. 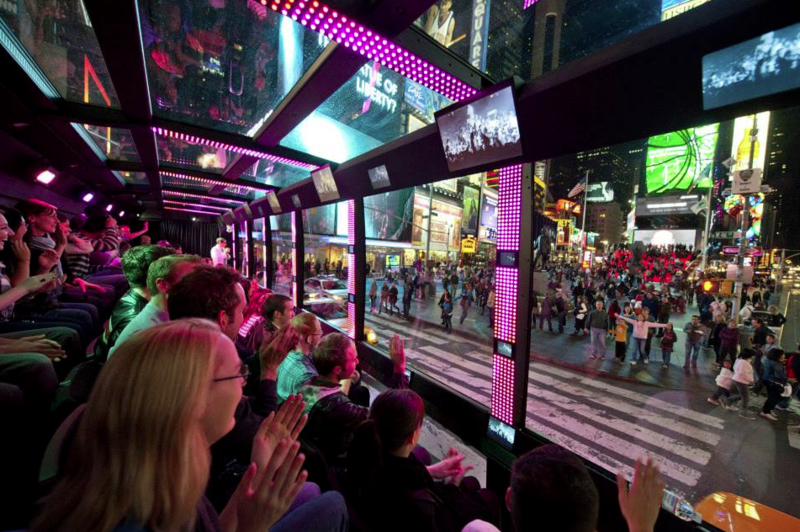 The Tour NYC – in these buses the seats all face towards the window (as oppose to facing forward), and the tour takes you by NYC’s major landmarks. *deal $29 per person, regularly $49. Gray Line New York – offers several different tour options, including the double decker open top tour bus with several different route options. Prices start at $49 per adult. 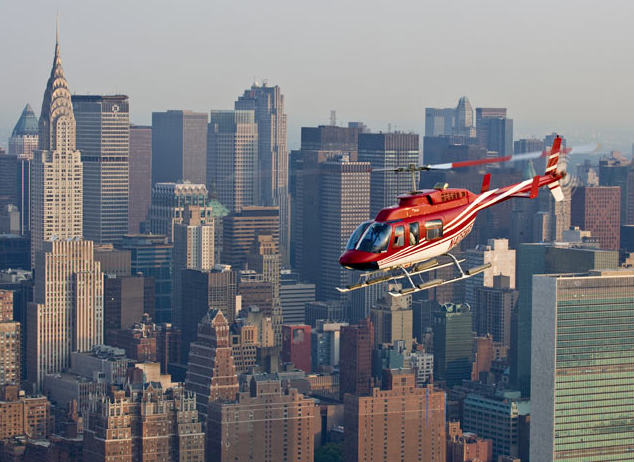 Helicopter – if you’re feeling really daring and want to see NYC from above, check out New York Helicopter. Tours start at $169. *Deal $119 (regular $174) for Liberty tour. Shopping: Shopaholics beware! Get ready for the finest of the finest. NYC of course has every store imaginable. Depending on your taste, style and budget there is something for you. I like to keep it simple, but I definitely recommend buying something to remember your visit. Even if it’s a cheesy trinket from a touristy store, you will have something to remind you of your visit to New York. How cool are these dining accessories with the classic New York accent?!? I spotted these on the boardwalk in Coney Island. Food: If you are a foodie, NYC is your town. New York City has unlimited possibilities when it comes to food choices. I’m a pretty simple gal, I love my classic slice of New York pizza, so my personal food recommendations are going to pizza and Shake Shack, (splurging is not required!). But, if you are a food connoisseur, do your research online and take yourself out for a fancy night in the big town! Basically, when it comes down to it, I would say spend your money on the things you love the most. If you’ve dreamt of going to the top of the Empire State building, then do it. If your dying to go eat at a fancy Manhattan restaurant, do it. If you budget right, try to squeeze in some areas to splurge and treat yourself to something special. New York is an amazing city, and I hope all you dreamers out there can start planning your next trip to the the Big Apple! We only have 2 weeks left of our series! Next week’s Part 6 will be Guide to NYC – on a budget: The other boroughs, giving you tips on exploring Queens, Brooklyn, The Bronx and Staten Island on a budget! What’s your dream thing to do or visit in NYC? Let me know in the comments below!